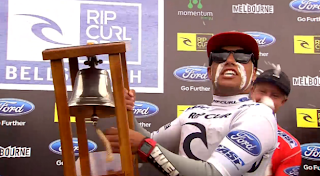 Adriana De Souza took down Nat Young in the final of a competition filled with some big upsets to ring the bell at the Rip Curl Pro Bell's Beach, the second event of the WCT season and also the second of the two competitions down under. Notably absent from the final were the most recent champs: Kelly Slater fell to Willian Cardoso in the 3rd round; Joel Parkinson lost to Raoni Monteiro in that same round; and De Souza took down Mick Fanning in the quarters on his way to the victory. To get to the finals, Nat Young had to get through Aussie ripper Taj Burrow in the semis, and although Taj had 9 scored waves to Nat's 5, Nat had the ones that counted with a combined score of 15.10 that beat out Taj's 13.43. De Souza had a much closer battle with Jordy Smith and advanced to the finals by a razor thing margin, 18.44 to 18.40. Once in the finals, De Souza was able to continue his momentum and pull out yet another tight victory, with a 16.26 to 15.83 wave score win over Nat Young. On the women's side of the action, Carissa Moore held off Aussie Tyler Wright in a scrappy final marked by a lull that lasted over 25 minutes. Carissa nailed 2 solid waves for a score of 15.40 that was enough for her to ring the bell. Carissa's first place result also moves her into first place in the overall women's WCT ratings over - you guessed it - Tyler Wright. I'm sure this duo will see each other more this season. The WCT travels next to Brazil for the Billabong Rio Pro beginning May 8. We'll see if Adriano can follow up on his huge result down under with another huge result at his home break. Or maybe Taj Burrow will string together another strong performance and move into position to stalk his first world title.